by Professor Adam Chapnick, professor of defence studies at the Royal Military College of Canada (RMC) and the deputy director of education at the Canadian Forces College. The New York City Building in which this photograph was taken was constructed in Queens, New York in 1938 to support Mayor Fiorello LaGuardia’s bid to host the 1939-1940 World’s Fair. To celebrate the completion of the new structure, the area around it was officially named Flushing Meadow Park. (It has since been changed to Flushing Meadows Corona Park.) When the Fair ended, the building housed both an ice rink and a roller skating arena. In 1946, Mayor William O’Dwyer convinced the United Nations Organization (UN), as it was then called, to use the building as a temporary home for the General Assembly. The site was not secured in time for the UN’s first meeting in London in January 1946, but it was available for the second session, beginning on 23 October 1946. Pictured in the photograph on the right is William Lyon Mackenzie King. The most successful federal politician in Canada’s history, King became leader of the Liberal Party in 1919 and prime minister in 1921. Thanks in large part to his ability to maintain strong support in the province of Quebec without sacrificing his government’s British bona fides in the eyes of the rest of Canada, King had led his country for 20 of the last 25 years before 1946. On the left is Paul Martin (Sr.), King’s ambitious new minister of health and welfare. Born almost thirty years after his prime minister, Martin would fail to succeed him as Liberal leader twice, before ultimately being named Canada’s secretary of state for external affairs in the mid-1960s. While this was King’s first experience at the General Assembly, Martin had attended the London session as a member of a non-partisan Canadian parliamentary delegation that was typical of the later 1940s. 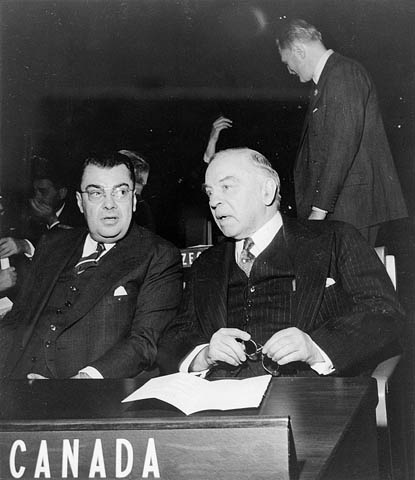 The representation of a large number of Canadian elected officials at these early UN meetings reflected Prime Minister King’s belief that national unity dictated a non-partisan approach to Canada’s UN engagement. It also reflected the fact that Ottawa did not establish a permanent UN mission in New York until 1948. The inclusion of both the 71 year-old King and the 42 year-old Martin in the photograph is a fitting representation of the generational shift taking place in Canadian foreign policy at the time. King was forever wary of international entanglements that might have compromised his delicate political balancing act at home. Some Quebeckers had already abandoned the Liberals because King imposed conscription during the Second World. The prime minister feared their response to another act of international enthusiasm. Moreover, in light of recent disputes between the Western powers and the Soviet Union over the German peace settlement, King had already come to doubt the value of the UN as a centre for global governance and conflict resolution. Recognizing that his retirement was near, the Canadian prime minister had finally relinquished the external affairs portfolio to his internationalist-leaning former minister of justice, Louis St. Laurent. But King remained suspicious of what Canada’s more idealistic representatives might do or say on the world stage without his approval. Martin, on the other hand, was part of a new generation of practitioners who were convinced that Canada could not prosper in the post-Second World War order without being actively engaged in global affairs. His Canada was an international country, dependent on a stable, peaceful world order for its economic prosperity. Robust alliances and healthy multilateral institutions were therefore critical to Canadian success on the world stage. Like the vast majority of Canada’s foreign policy bureaucracy, Martin therefore saw the United Nations as a critical venue for the advancement of Canadian interests. By promoting international cooperation, the UN’s organs and agencies could lower the proverbial global temperature, provide relief for the economically disadvantaged, and promote stability within and among those states unable to defend themselves against aggression. Contemporary critics of the United Nations often allude to how the organization has lost its way. Looking back on the Canadian experience in 1946 reminds us that success has never come easily. Effective global governance requires persistence, resilience, and a good deal of faith.